Black unemployment is nearly double that of the national average. Black Americans are disproportionately represented in the lower-earning strata of workers because so many have education and technical skills that lag significantly behind the norm. Why, then, do so many black leaders support more immigration, both legal and illegal? Why do they fight education reforms, such as school vouchers, which would allow black families access to better schools? And why do they continue to advocate government dependency programs instead of directing time, effort, and money to financial and workplace literacy and competency? Wrong. If discrimination is part of the problem, it is a minor part. From 1900 to 1960 the black participation rate in the labor force was equal to or higher than whites. Was there less discrimination then? Did we not just elect a black president? Twice? Our labor market is flooded with immigrants, many here illegally, which has the double-whammy effect of stealing entry-level and baseline jobs from Americans while pushing down pay rates – simple supply and demand. When combined with well-meaning government benefits programs, and an education system that does no favors to poor families, it sets up the perfect storm for a perpetually unemployed class of citizens, a disproportionate number of whom are black. Maybe this is no accident. A person dependent on government benefits for his free food will probably vote for the person who, cynically, promises more free food (whether or not he delivers). 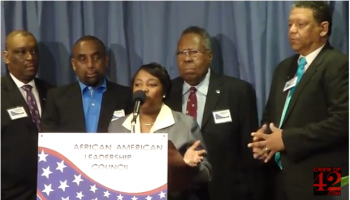 Today the Black American Leadership Alliance hosted a march and rally in Washington, DC. Calling it the “March for Jobs”, the organization called on Congress, the Gang of Eight, and the Congressional Black Caucus to oppose the headlong rush toward amnesty for illegal immigrants and increased legal immigration. This is the kind of leadership needed, not more of the same old failed liberal policies: increased immigration with less border enforcement, government and union control over education, and accelerating dependence on benefit and food programs. This entry was posted in Education, Liberals, Our Economic Mess and tagged al sharpton, black american leadership alliance, black unemployment, immigration, jesse jackson, leah durant. Bookmark the permalink. Where’d All the Good People Go? to MontKotaWyoRasKanRado!